Ok. I’ll admit. I’m a list guy. I’m a post-it guy. All OVER the place. It’s really an issue. Emily laughs about it now, but there was certainly an initiation phase into Seth’s land of lists and post-its. She’s probably stronger because of it. Love you babe! In college I would have notebooks full of ideas and future plans, but it was hugely unorganized and how would I ever find a random idea in there? I’d also use post-its for stuff I’d need to do right then. I even dabbled with the infamous Palm Pilot organizer. The only problem is that 8 years before “the cloud” I was imagining something like “the cloud.” The Palm Pilot was great, but it was just a notebook. If I didn’t have it with me- I didn’t have it! Plus it wasn’t really that searchable. Then came the email-catch all phase. Who else does this? I can’t be the only one. I’d email myself all of my ideas and dreams and plans when they popped in. I’d even email myself to take out the garbage that evening, because I knew I’d forget, but I’d check my email before I went to bed! Does anyone know the problem with this? Yep- cloggage. Major cloggage. A log jam of log jam clogs in my inbox. I get enough email, but then I have 35-40 emails from MYSELF about things that are…ideas. What do I do with these!?! Here is my current solution: I realized my thoughts “mental tornadoes” could be placed into 3 general categories. 1. Evernote Websites/Creations/Lesson Plans/physical things that have been found or accomplished but need to be recalled again or improved upon and would be useful for future applications. This is where I take pictures of my music classroom before or after an awesome lesson so that I can save the pic of the setup, a description and tags pertaining to that concept/lesson/grade/activity. Then I can search those later in the future when I return to that concept again. You can do the same thing with websites (like Delicious). I’ll open the app on my phone, take a pic of a possible project at Lowe’s, tag it, describe it, set the geo-location of where I am, and be able to get it later. 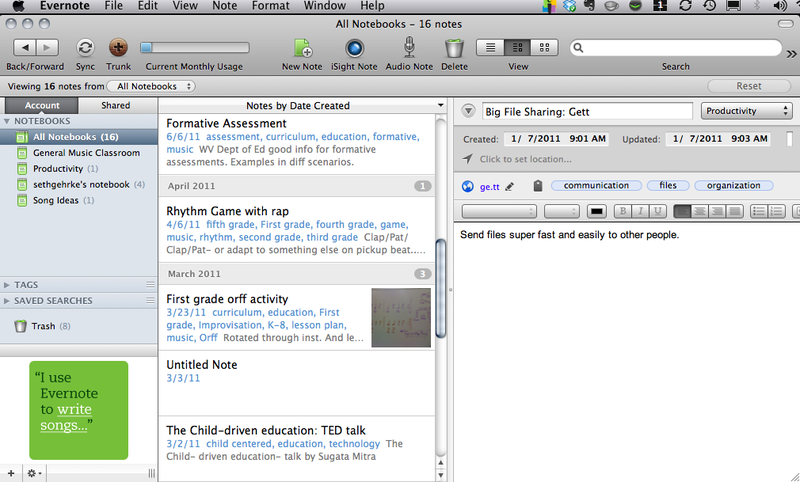 Then I can access it online anywhere or from a direct mac or iphone app. Another option to make a voice memo note and tag and describe that as well. Love it. 2. Workflowy Dreams/Thoughts/Planning/Ponderings- for many categories of life/work. My thanks to my buddy Thomas for throwing this idea out a while back! It works great for me. It’s really a very simple, creative way of keeping lists. I think it’s designed for step-based projects and sometimes I used it for that, but mainly I just keep multi-leveled lists here. It’s so intuitive and easy to use. You make a heading like the ones you see on my homepage. Then you click on the dot and it brings you to the sub menu of that main point without seeing all of the other main headings. Then you can have sub-sub menus to further describe detail what each idea entails. This may sound extremely frustrating to some people, but it works amazingly well for my brain’s organization. It’s really easy to go back and scan through your “idea flows” as I call them. Plus I can access it from anywhere as well. No more random notebooks. 3. 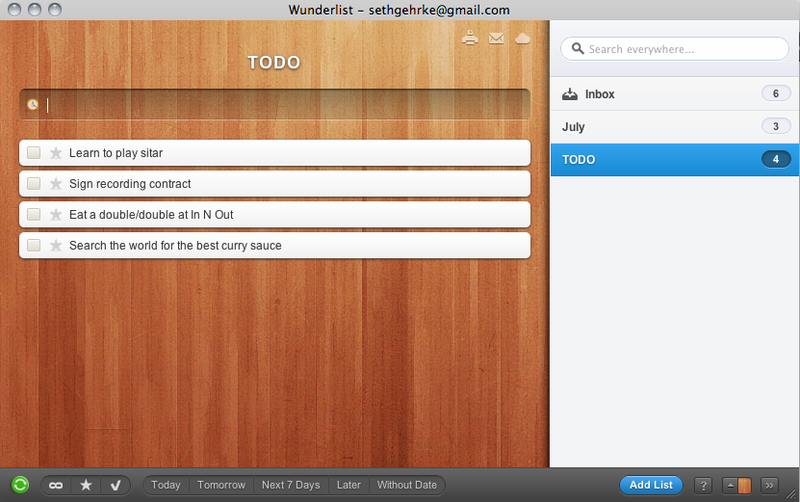 Wunderlist TODO- anywhere between NOW and 1-2 months out. Definite Actionable items to cross off. I just started using this about 2 weeks ago. I used to use Google Tasks, but I like how much more clean this is. Plus I like how I can check it off, it turns grey, gets crossed out and falls to the bottom of the page. I feel so successful! This is only for TODO. No ideas- just tasks. The app loads quickly on my phone, so it’s just as easy as emailed myself and doesn’t clog up my inbox. I made a sample list for you here. I’ll probably finish that up tonight. You can also create different lists if you have different “jobs” in your life with separate tasks. You can set alarms for your tasks and add details as well. It’s working great so far. I’d be happy to tell you more about them if you have any questions. I have to end with the best part about all 3…they’re free! So get organized and keep your brain happy. I know it keeps me sane. So, what do you use to stay organized and catalogued? Hit up the comments and let me know about your brain supplements!